Sheffield’s railway station has been hailed as having one of the best cycling facilities in the country in an awards victory. A flagship cycle hub, which provides 400 spaces for bikes indoors, with access through a digital security door, opened at the station earlier this year. Russell Cutts, who helps to manage the hub and has his own shop called Russell’s Bicycle Shed inside, said: “I didn’t expect it would be getting awards regardless of how soon it was after we opened. 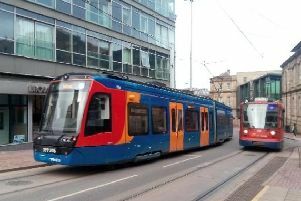 “It is great news for Sheffield and Sheffield station. “Since the key fob system came in we have sold 615 fobs so we are over capacity at the moment compared to the number of bike stands. “We just hope the day doesn’t come when everyone decides to cycle in and wants to park their bikes! The hub - which cost £850,000 - was unveiled in July, on the eve of the Tour de France coming to Sheffield as part of the Yorkshire Grand Depart. Transport minister Baroness Kramer opened the facility, and said it was a ‘great example’ of how using bike and rail to commute could cut pollution and ease congestion. The hub also has changing rooms and repair facilities for cyclists. East Midlands Trains operates Sheffield’s station. Jonny Wiseman, route manager for the company, said: “A lot of hard work has gone in to improving Sheffield station for all passengers. “This includes major improvements to the cycling facilities and it is great news this has been recognised by the awards. “The cycle hub is one of the best facilities for cyclists in the country, offering secure storage as well as extra facilities such as changing rooms and a shop, which is run by a small, local trader, offering sales as well as repairs. Cyclists also praised the hub, which provides a safe place for them to park bikes, out of the reach of thieves, . More hubs are expected to be opened across the city to meet demand.